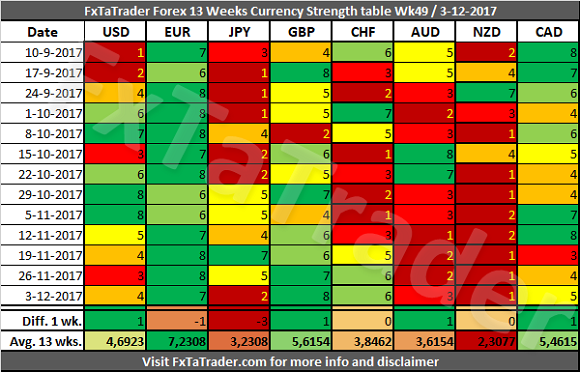 In the Currency Strength table, the GBP was the strongest currency while the NZD was again the weakest. There were some significant changes last week with the USD, GBP, AUD and CAD gaining 1 point, the JPY losing 3 points and the EUR losing 1 point. The GBP showed a good performance during the whole week and a very strong performance at the end of the week. The CAD and CHF showed a very strong performance at the end of the week and the EUR a steady and strong performance during the whole week. 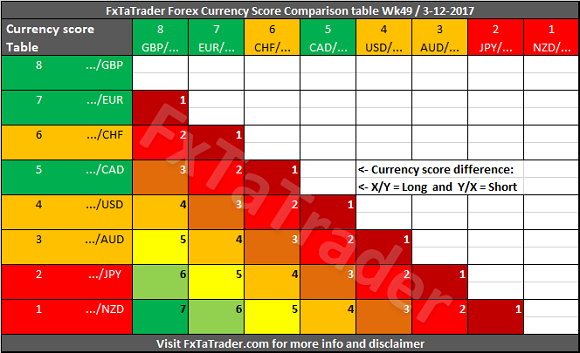 The GBP, EUR and CAD are Strong currencies and fit exactly with the current performance in the Classification and Score. The CHF is a Neutral currency and does not fit exactly with the current performance in the Classification and Score. However, being a Neutral currency it may offer some good opportunities against the Weak currencies. The USD, CAD, AUD and NZD showed a weak performance during the whole week. The NZD is a Weak currency and fits exactly with the current performance in the Classification and Score. The USD and AUD are Neutral currencies and do not fit exactly with the current performance in the Classification and Score. However, being Neutral currencies it may offer some good opportunities against the Strong currencies. Based on the development as described above it seems that going long with the EUR or GBP against the NZD, USD or AUD may offer good opportunities. If this is being confirmed by the analysis in both of my Weekly articles and the charts are looking in the right direction, these combinations may offer good opportunities. Next, the 13 weeks average is considered, see the last row called "Avg. 13 wks." When looking at the Average 13 wks. Score we can see the currencies grouped together according to their classification. There may be some doubt and in that case it could be a currency that will change its classification in the coming weeks. There are no such currencies at the moment. The EUR is the strongest currency and continues to deliver high Scores. Neutral - The USD, AUD and CHF are grouped together around an Average 13 wks. Score of 3,5 to 4,5. Weak - The JPY and NZD are grouped together around an Average 13 wks. Score of 2 to 3. This week we take a look at the Classification changes. The CHF has become a Neutral currency after showing a good performance in the last 3 weeks. The GBP showed even a better performance during the last 4 weeks and has become a Strong currency. We can see in the chart the strong performance of both currencies. Below you can see the Weekly Currency Score Chart with the 6 months' data as a reference. Strong: EUR, GBP and CAD. The preferred range is from 6 to 8. Neutral: USD, AUD and CHF. The preferred range is 3 to 5. Weak: JPY and NZD. The preferred range is from 1 to 2. The comparison table provides a way to compare currencies from a longer-term perspective of 13 weeks and also simultaneously taking the current trend into account. By coloring the currencies in the X and Y axis according to their Classification we can show what the best combinations are. First of all better-classified currencies in combination with weaker-classified currencies can always be traded and vice versa. The Currency Score difference may be negative. In that case, the trade should be made after a pullback. In other words, a trade can then only take place after a recovery and the main trend being confirmed again. Second, only equally classified currencies are approved when there is a positive Currency Score difference. Also here, the trend has to be confirmed again. The difference between point 2 and 1 is that the long trend is not clear with 2 equally qualified currencies because that pair is in a sideways market. For that reason, the Currency Score difference cannot have a negative difference. A positive difference confirms the momentum for a short revival. Third, only Neutral currencies are Approved against a better-classified currency when there is a Currency Score difference of at least +4. In the case of a currency worse classified, the Currency Score difference has to be at least -4. The above-mentioned situations applicable to this point may happen when there is a clear reversal and the chart is showing a new trend with good entries in the new direction. The difference between point 3 and the previous 2 points is that with point 3 a reversal in the whole market is possible when looking at all the currencies together. This gives a better chance when a trend reversal takes place compared to point 1 and 2! By preference, each currency should be selected for a trade with a score difference as far apart from each other as possible in the range from 1 to 8. However, these opportunities are rare and for that reason point 1 offers flexibility and is the best choice to trade, point 2 is the second best and point 3 is the third best choice. The classification of the currencies in question may change in the longer term. Even though currencies may be in the same category a currency may be in a weaker/stronger period and may even change its classification in the future. 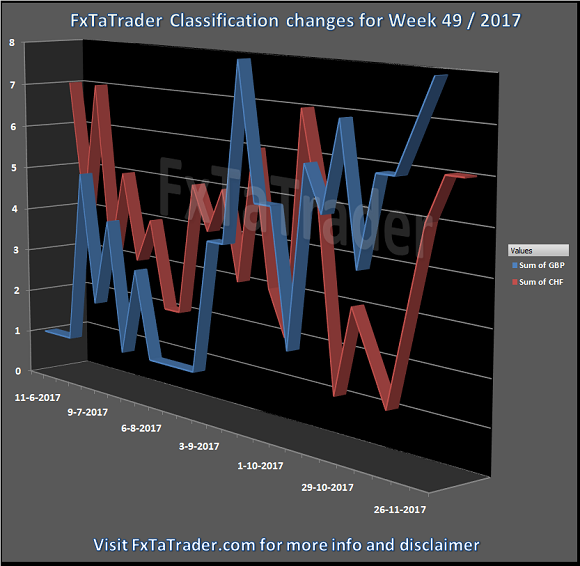 See the current classification for the coming period at the beginning of this article. Currencies with a high deviation seem less interesting to trade because they are less predictable. This week there are none. DISCLAIMER: The articles are my personal opinion, not recommendations, FX trading is risky and not suitable for everyone. The content is for educational purposes only and is aimed solely for the use by ‘experienced’ traders in the FOREX market as the contents are intended to be understood by professional users who are fully aware of the inherent risks in forex trading. The content is for 'Forex Trading Journal' purpose only. Nothing should be construed as a recommendation to purchase any financial instruments. The choice and risk are always yours. Thank you.